Now that we are settled in our new home, I couldn’t be happier with the neighborhood we chose. It was a really hard decision, to know that we’d be stuck wherever we chose for two years, yet we hardly had time to get to know the area before making the decision. We started our quest to choose a neighborhood before we even set foot in Singapore. We looked at maps, read online descriptions and travel books and browsed expat forums. It was really difficult to get a feel for a place without having been there, but we did what we could. When we arrived, we toured the neighborhoods we were considering. We also chose our school based on commute times from neighborhoods we were likely to choose. We narrowed the list to five neighborhoods, Orchard, Holland Village, River Valley, the East Coast and the area around the school, near Upper Serangoon. The single most important way to get to know a neighborhood is to visit. We had our agent take us on tours of the neighborhoods on our list. People who already live here are a great resource, so we asked people where they lived and what they thought of their neighborhood. We took the subway to the prospective neighborhoods and walked around, both during the day and in the evenings and weekends. We stayed in temporary quarters in one of the neighborhoods, and we rented a car for a day to get a feel for whatever we thought we had missed in the others. We chose the neighborhoods based on a number of factors. First, we wanted to limit school and work commute times to maximize everyone’s home time. That ruled out some popular neighborhoods and schools, like Singapore American School and the Woodlands, since Joel works near Raffles. Second, we wanted a high concentration of expats, where school friends were likely to live to make play dates easier. Finally, we wanted an area that was walkable, close to the MRT, and had a lot of amenities, to make a car an unnecessary luxury rather than a necessity. We decided to spend our car budget on housing instead, which in the end made for a much better place to live. We finally narrowed the choice down to Orchard, Holland Village and River Valley, and concentrated our housing search. We found an apartment in each area we really liked, and agonized for a week over which apartment we wanted. In the end, while we liked the amenities in Orchard, after staying there six weeks, we decided the crowds were driving us crazy. I would liken it to living in Times Square. Great for a visit, but living there was getting to us. It was too busy and too expensive. Even taxis had a premium, because you have to pay an extra fee to drive in the central area. We have always chosen areas in past cities we lived that were a bit quieter than the central areas. We lived in Oakland instead of San Francisco, and Brooklyn instead of Manhattan. Therefore, we nixed Orchard and narrowed it down to River Valley and Holland Village. River Valley is a really great neighborhood, and if there were not children involved, we probably would have chosen to live there. It is very walkable, quiet and charming. Bars and restaurants are plentiful, and it has the peaceful ambiance of the river. It reminded me of San Antonio’s River Walk area, a place I had enjoyed visiting many times. We found a beautiful apartment in our price range. There were quaint little shops nearby. It was really wonderful. Any great neighborhood is not without downsides, however, and River Valley is no different. The MRT was not close enough to the apartment we liked, and the vibe of the neighborhood was less family oriented. It oozed partying singles on the weekends. We thought the charm of the bars and restaurants might wear off quickly, and quite frankly, a cab ride to River Valley from either of our other finalists is only ten minutes, so we decided it was a better neighborhood to visit rather than live for our needs. Finally, we evaluated Holland Village, and decided it really met our criteria. It seemed to be the Park Slope of Singapore – walkable and filled with stay at home moms with strollers during the day. At night, the streets close off and it transforms into a vibrant bar and restaurant scene where kids are tolerated if not welcome. The nearby condos are more family centered and there are a lot of kids from the school living nearby. After school, there is an activity bus that Kate takes three times a week. Coincidentally, one stop is literally next door to one of the condos on our list. While staying at Orchard, I was walking 20 minutes to the activity bus stop in the Orchard neighborhood, and about 10 minutes of that commute was just trying to get through the crowd with a stroller. In Holland Village, it wasn’t a problem at all, and not even a three minute walk to the activity bus stop. The final nail in the coffin, so to speak, was when I called the bus company to get commute times for the children. Because River Valley has fewer children taking the bus, it has fewer buses going to it, and made many more stops to fill it up. The commute on the bus from the condo we liked in River Valley was 40 minutes for the children, but at the place we liked in Holland Village, it was 20 minutes, even though Holland Village is technically farther away. Add that to the fact that the closest activity bus to the condo in River Valley was at Orchard, and suddenly it just didn’t make sense to move to River Valley. In the end, we moved to a condo in Holland Village. 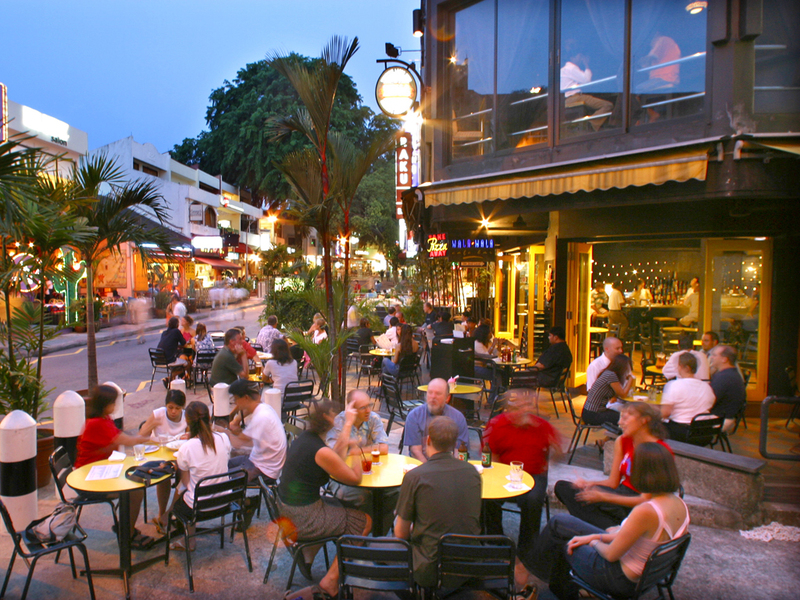 We are a 15 minute walk to Holland Village, five minutes from the MRT, and a 15 minute walk to Dempsey Hill, which we learned is filled with expats in the evenings and weekends. It has a lot of swanky hip restaurants and bars, as well as shops and specialty food shops, like butchers and grocers. There is even an indoor play space for children. Our condo is so well located that we don’t feel we need a car, which in Singapore can really set you back financially. We take a lot of taxis and MRT trips, or we walk, and so far it is much less expensive than driving here, where renting a Camry type car for a month costs $1200-1400. As an added bonus, all this walking is good for the heart and the waistline, and we don’t have to learn how to drive on the “other” side of the road. *Now we’ve moved to Singapore for the second time. To read more about where we chose to live the second time around, click here. We will be moving at the end of this year (nothing says happiness like a move over Christmas!). I have 2 boys ages 10 & 12. I’m worried about the commute to SAS (we are currently wait listed), as you mentioned in your blog. Do your kids go to SAIS? Looks like the commute isn’t too bad. I hear lots of mixed things on the forums, etc…. It seems like you have been pleased with the school your girls are attending. I’ve been enjoyed reading your blog and get a good laugh! My wife and I will be relocating to Singapore this summer. We have started researching schools and housing based on schools. Found your blog while researching. Can you reach out to you with questions? I must say your blog is proving to be one of the best resources I have found regarding Singapore. The main concerns my wife and I have are finding a good school and living near other American expats. We have two small girls, ages 3 and 1. I’m hoping you are able to offer some thoughts on schools and overall cost of living. While my company will be moving us to Singapore they will not be assisting with housing or school. While we wait, I have been doing research on where to live in Singapore with small children. Based on our office locations, I chose neighborhoods along the Circle Line, e.g., Buona Vista, Holland Village, Farrer Road, etc. Would you be willing to exchange emails about the pros and cons of the condos you looked at? I too am based in the Bay Area and am curious whether there is a neighborhood that is somewhat similar to my current home town of Alameda, CA. I hope you are acclimating well to life in the Bay. We are going to move soon with 2 years old son. Doing now the same research where to liven the same area. It will be great if you could share info about locations and condo you found. Thanks. This is a great article, It helped me to categorise my priorities while moving to Singapore with my wife and 3 yr. old daughter. Although I visited Singapore in 2013 but now I have to relocate here for my business expansion. The main concern i have is my kid schooling, not sure which region in Singapore is best fit for young Indian couple with a kid looking for an area where we can found nearby school, sports hall, nearby MRT and nearby fairprice or coldstorage. Would you do a favor by suggesting us your valuable findings ? Hello, apologies I know this was written a while ago but we are basically in the same position as when you wrote this. We have just landed as a family IN Singapore with 3yr old and 1yr old and getting very confused re condos. We love the Holland V area but cannot find the right family condo close enough to the MRT. Would you be willing to share which you chose with me please?